Summit County has an impressive selection of whitewater rivers to run, from the raging Class V deluge of the Arkansas River to the quieter sections of the Blue River. Explore the beautiful rivers of Colorado with us! Safe and fun for all experience levels. 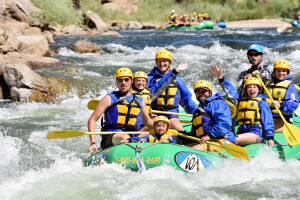 Exciting and scenic rafting trips on the best rivers of Colorado for all ages and abilities. 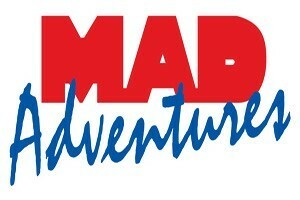 We're MAD about giving our customers the best whitewater rafting trips in Colorado! Wickedly awesome class III & IV rapids, or family friendly rafting. 1/2 or full day trips. Twice named “Colorado Company of the Year”! Wilderness Aware Rafting offers premier quality rafting, horseback riding and zip lining trips for your Breckenridge adventure! 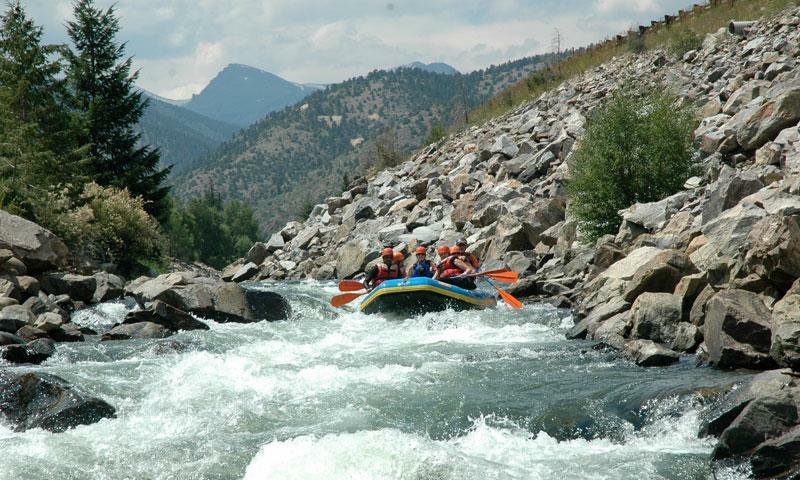 Rafting in Colorado’s pristine, rushing rivers is an experience that can’t be beat! Choose from 4 rivers and a variety of adventures. Plus zipline, biking, and combo trips. Voted best Rafting Company by Locals 11 years running! Whitewater raft, zip line, horseback, SUP, and Bike rentals conveniently located to Breckenridge! Providing beginner to expert whitewater rafting trips on Colorado’s best rivers. This will be the highlight of your trip this summer. Be sure to reserve your spot today. 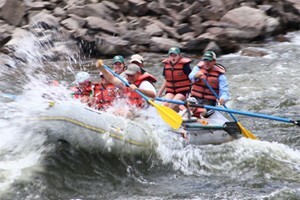 White water rafting May through August on Exciting Clear Creek and Arkansas River. All river gear provided. Ask about child and group discounts. Specializing in Colorado adventures since 1983, Choose your own adventure whitewater rafting, rock climbing, backpacking, and an aerial adventure course. Let our guides take you down the Colorado River through two majestic canyons on class II & III rapids. Full or half day trips with lunch all summer. Experience the the exciting adventure of rafting on one of Colorado's 5 most spectacular rivers. Great for all ages, abilities. An overnight rafting trip through the Colorado back country is an unforgettable experience. River options in the area include the Arkansas, Blue, Clear, Eagle and others. Water levels vary throughout the season, so talk with the guides to find the right river for you. For those who don't want the adrenaline of heavy whitewater, a scenic float trip is the perfect choice. Whether you're in Keystone or Breckenridge, whitewater rafting should be on your list of things to do. The rafting in the area is famous for the scenery as well as the whitewater rapids. These rivers offer something for people of ages and skill levels, so come prepared to have a great ride! 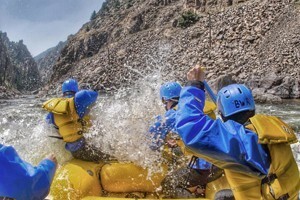 Whitewater: The classic rafting trip includes the thrills and spills of Colorado whitewater. Rapids range from small ripples to raging class V monsters, which are guaranteed to soak you to the bone. Don't worry, the water will feel great as you take on river holes, haystacks and wave trains. Just remember to hold on! Scenic Float: A scenic rafting trip is a quieter experience. Lay back, relax, let the current take you downstream, winding through the canyons and forests. This is a great opportunity to spot eagles, hawks, deer and other wildlife, so make sure your camera is charged and ready. These trips are perfect for younger kids. Overnight trips are common options, giving rafters the chance to relax in the cool summer evenings while the guides take care of dinner. The mountain rivers and creeks are highly variable because of the snowmelt coming off the mountains. One week, a river might be a lazy, scenic float trip. Then the next week, the river could change completely, making it nearly unnavigable. Because of this, talk to the local guides to figure out when and where the best option might be. It simply depends on the time of year and the trip you're looking to book, because the same river has different personalities during different seasons. Because the Blue River flows through both Keystone and Breckenridge, rafting is all around. The Class III whitewater conveniently starts in Silverthorne, so there's no excuse not to get out for at least a half-day on the river. This is one of the country's most pursued rivers because of the topography it runs through. Dropping nearly a mile over its first 125 miles, there's a lot of whitewater for rafters. Think about taking a multiple day adventure on this river. It has a number of different segments, such as the Narrows, Royal Gorge, and Browns Canyon, so an overnight adventure give you the chance to run more than is possible in a single day. Plus, the quiet evenings in the wilderness are a great contrast to the excitement of the day. This river, more than most, varies with the weather. Being so close to the snowmelt, the water levels can change drastically. This, of course, means for some great whitewater rafting in the spring. Starting as early as April, the summer sun breaks water from the snowpack, which drains directly into the river. If you're there during spring runoff, this river is a must. This rafting trip is a local favorite. The creek may be small, but it packs a whollop! Starting on Loveland Pass, Clear Creek offers different sections for different adventures. Depending on the size of the group, the type and length of the trip, guiding companies will charge different rates. Take a look at the companies below for specific details of the trip, including prices and minimum age levels. Take the hassle out of the trip by hiring a guide! This way, you can focus on the experience at hand. 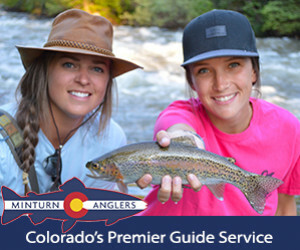 The Colorado River Outfitters Alliance provides training and a standard of service for all river guides. The National Organization on Rivers provides river and conservation information for boaters.